aths used to consist of a big tub filled with hot water, and the man of the house had the privilege of the nice clean water, then all the other sons and men, then the women and finally the children. Last of all the babies. By then the water was so dirty you could actually lose someone in it. Hence the saying, Don't throw the baby out with the Bath water. ouses had thatched roofs-thick straw-piled high, with no wood underneath. It was the only place for animals to get warm, so all the cats and other small animals (mice, bugs) lived in the roof. When it rained it became slippery and sometimes the animals would slip and fall off the roof. 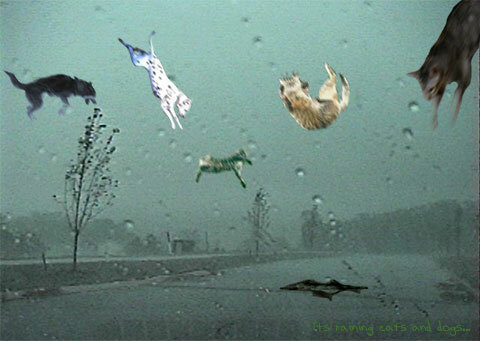 Hence the saying: It's raining cats and dogs. ere was a time when floors were dirt. Only the wealthy had something other than dirt. Hence the phrase, dirt poor. he wealthy had slate floors That would get slippery in the winter when wet , so they spread thresh (straw) on floor to help keep their footing. As the winter wore on, they added more thresh until, when you opened the door, it would all start slipping outside. A piece of wood was placed in the entranceway. Hence the saying a thresh hold. n those old days, they cooked in the kitchen with a big kettle that always hung over the fire. Every day they lit the fire and added things to the pot. They ate mostly vegetables and did not get much meat. They would eat the stew for dinner, leaving leftovers in the pot to get cold overnight and then start over the next day. Sometimes stew had food in it that had been there for quite a while. Hence the rhyme, Peas porridge hot, peas porridge cold, peas porridge in the pot nine days old. ometimes people could obtain pork, which made them feel quite special. When visitors came over, they would hang up their bacon to show off. It was a sign of wealth that a man could, bring home the bacon. They would cut off a little to share with guests and would all sit around and chew the fat. read was divided according to status. Workers got the burnt bottom of the loaf, the family got the middle, and guests got the top, or the upper crust. ead cups were used to drink ale or whisky. The combination would sometimes knock the imbibers out for a couple of days. Someone walking along the road would take them for dead and prepare them for burial. They were laid out on the kitchen table for a couple of days and the family would gather around and eat and drink and wait and see if they would wake up. There is how the wake got its name. ngland had limited land and the local folks started running out of places to bury people. So they would dig up coffins and would take the bones to a bone-house, and reuse the grave. When reopening these coffins, 1 out of 25 coffins were found to have scratch marks on the inside and they realized they had been burying people alive. So they would tie a string on the wrist of the corpse, lead it through the coffin and up through the ground and tie it to a bell. Someone would have to sit out in the graveyard all night (the....graveyard shift.) to listen for the bell; thus, someone could be, saved by the bell. re you hooked on etmyology yet? See Online etymology dictionary.